The most often described space tethers are the momentum exchange tethers, so called because they allow the transfer of momentum (and thus energy) between two objects. The main benefit of these types of tethers is that they allow changing the orbits of spacecraft without using any rocket propulsion. For example, imagine two equal satellites connected by a long tether and circling Earth, one in a lower orbit than the other. Because the satellites are the same, the center of mass of the combination lies halfway between them. If we want to calculate the orbital speed of this satellite system, we could pretend we are dealing with a single spacecraft located at the combination's center of mass. For the laws of orbital mechanics, it is irrelevant what the satellite system looks like; the whole contraption will stay in orbit as long as its center of mass has the right speed for the altitude at which it is circling. However, because the lower satellite is closer to Earth than is the center of mass, it is actually orbiting too slowly for its altitude. It will therefore try to fall back to Earth. In contrast, the other satellite is moving too fast for the gravity at its orbital altitude, and will try to pull away. Because the spacecraft are kept together by the tether, they continue orbiting at an average speed that is too high for the lower satellite and too slow for the higher one, but just right for the system as a whole—that is, its center of mass. The result is that both satellites are pulling like dogs on a leash, so that the tether remains taut and forces the two to orbit like a single spacecraft system. 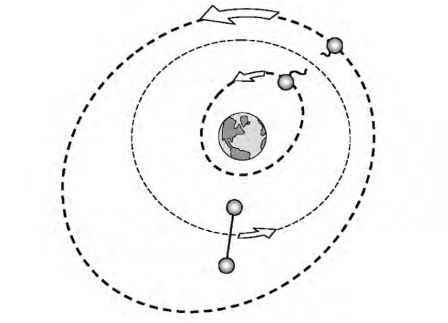 Moreover, because one satellite is trying to fall back to Earth and the other is trying to pull away, the tether system automatically orientates itself into a stable, vertical position perpendicular to Earth's surface. Since this effect is caused by the difference in gravity at different orbital altitudes, it is called gravity-gradient stabilization. It is as if the lower satellite is being dragged along by the higher one, and in turn the upper satellite is pulled back by the lower satellite. The spacecraft are basically sharing their individual momentum via the tether, hence the term momentum exchange tether. If the tether would go slack, each satellite would be able to move independently and go its own way, one moving down and one up until the tether was stretched tight and vertical again. What happens if we cut the tether? The lower, "too slow'' satellite is now free to follow its own orbit and starts to fall. Because it lacks the energy to stay at its original altitude, it will enter an elliptical orbit with a lower perigee than before. Its original orbital altitude becomes its apogee. If the new orbit intersects Earth's atmosphere, that is, if the perigee is too low, the lower satellite will actually reenter the atmosphere. Momentum exchange tethers can thus be used to return cargo capsules back to Earth or make obsolete satellites leave orbit and burn up in the atmosphere. The upper, "too fast'' satellite, on the other hand, will shoot away to a higher altitude because it has too much energy. Its elliptical orbit will have its perigee at the altitude of the satellites original, forced orbit, but a higher apogee than before. 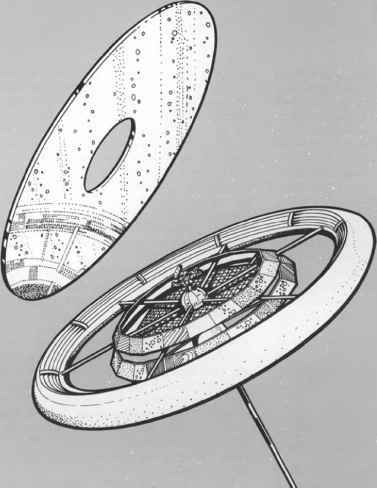 The two spacecraft have been put into different orbits using "tether propulsion'' rather than rocket propulsion (Fig. 1.12). Figure 1.12: Two satellites connected by a tether will each enter a new orbit when the tether is cut, one going down, the other going up. of the hammer as the higher altitude satellite and the thrower as the lower altitude spacecraft). An interesting consequence of the dynamics of momentum exchange tethers is that in this case it is possible to "push" on a cable! On Earth, cables can be used only to pull things with, because they go slack the moment you release the tension on them. However, if we push the lower satellite in our example, for example using a rocket motor, it goes into a higher orbit. As a consequence, the upper satellite is given some leeway and allowed to increase its altitude as well, until blocked once more by the pull of the tether. As a result, the whole combination (i.e., the center of mass) will now enter a higher orbit; effectively we have pushed the satellites up, as if they were connected by a steel rod rather than a thin, flexible tether.